NASA’s Swift satellite detected high-energy X-rays a few degrees from the center of our galaxy, toward the constellation Sagittarius. Produced by a rare X-ray nova, this outburst announced the presence of a previously unknown stellar-mass black hole that is located 20,000 to 30,000 light-years away. The rapidly brightening source triggered Swift’s Burst Alert Telescope twice on the morning of Sept. 16, and once again the next day. Named Swift J1745-26 after the coordinates of its sky position, the nova is located a few degrees from the center of our galaxy toward the constellation Sagittarius. While astronomers do not know its precise distance, they think the object resides about 20,000 to 30,000 light-years away in the galaxy’s inner region. The nova peaked in hard X-rays — energies above 10,000 electron volts, or several thousand times that of visible light — on Sept. 18, when it reached an intensity equivalent to that of the famous Crab Nebula, a supernova remnant that serves as a calibration target for high-energy observatories and is considered one of the brightest sources beyond the solar system at these energies. Even as it dimmed at higher energies, the nova brightened in the lower-energy, or softer, emissions detected by Swift’s X-ray Telescope, a behavior typical of X-ray novae. By Wednesday, Swift J1745-26 was 30 times brighter in soft X-rays than when it was discovered and it continued to brighten. “The pattern we’re seeing is observed in X-ray novae where the central object is a black hole. 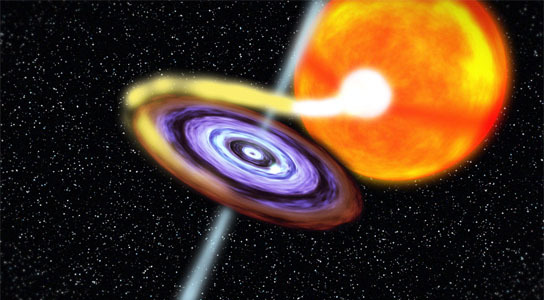 Once the X-rays fade away, we hope to measure its mass and confirm its black hole status,” said Boris Sbarufatti, an astrophysicist at Brera Observatory in Milan, Italy, who currently is working with other Swift team members at Penn State in University Park, Pennsylvania. This phenomenon, called the thermal-viscous limit cycle, helps astronomers explain transient outbursts across a wide range of systems, from protoplanetary disks around young stars, to dwarf novae — where the central object is a white dwarf star — and even bright emission from supermassive black holes in the hearts of distant galaxies. Swift, launched in November 2004, is managed by Goddard Space Flight Center. It is operated in collaboration with Penn State, the Los Alamos National Laboratory in New Mexico and Orbital Sciences Corp. in Dulles, Virgina, with international collaborators in the United Kingdom and Italy and including contributions from Germany and Japan. 2 Comments on "NASA Satellite Discovers a New Black Hole in the Milky Way"
It would almost seem a direct correlation that the suns activity inreased in unison with this event, coincidence or is this a regular occurance? supernova – here called short lived X-ray nova. It could be some neutron star also nearby. Black holes are extremely dense remnants of died out star losing all its energy collapsing into neutrons. There is no neutron star or supernova near our sun. The experiment is only on some far of galaxies. Please don`t connect solar activity to such cosmic scenes. Thank YOu.